Miri – 19 January 2015 – Lai Zhen Yue, a lecturer in Physics and Mathematics from the Science and Foundation Department of the Faculty of Engineering and Science, Curtin University, Sarawak Malaysia (Curtin Sarawak), was among recipients of the 2014 Curtin Awards for Excellence and Innovation in Teaching under the ‘Citations for Outstanding Contributions to Student Learning’ category. The annual awards presented by Curtin University in Australia aim to recognise and reward outstanding performance by individuals and teams at its Australian and international campuses in teaching and in enhancing student learning. Lai was awarded for her development and implementation of active and innovative learning strategies that enhance student learning in Foundation Engineering Physics. The awards are divided into three categories for which there were a large number of high-quality and very competitive applications. The categories are ‘Awards for Teaching Excellence’, ‘Awards for Programme that Enhance Learning’ and ‘Citations for Outstanding Contributions to Student Learning’. Lai joins a list of other outstanding recipients under the same category. They are Australian Award Scholarship (AAS) Learning Support Team, Curtin Teaching and Learning, Vice-Chancellory; Dr Janet Beilby and Kathryn Viljoen from the School of Psychology and Speech Pathology, Faculty of Health Sciences; Professor Dawn Bennett from the Humanities Research Graduate Studies, Faculty of Humanities; and Dr Iain Murray from the Department of Electrical and Computer Engineering, Faculty of Science and Engineering. Lai has 10 years of teaching experience and was a recipient of the Curtin Faculty Excellence in Teaching Awards – Teaching Citation Award for Approaches to Support Learning (Early Career) in 2013 and the Curtin Sarawak Student Choice Award in 2009, 2012 and 2013. Prior to joining Curtin Sarawak in 2009, she taught in Singapore as a secondary school teacher. Lai said that in order to effectively engage her students, she continually introduces new teaching strategies. This equips the students with the skills to be successful and active learners, and enriches their first-year learning experience. “People often ask me why I chose to teach, and I would quote William Arthur Wards, who said, The mediocre teacher tells. The good teacher explains. The superior teacher demonstrates. The great teacher inspires. That sums up my passion for teaching,” remarked Lai. Besides adopting learner-centred strategies to enhance the learning experience of students, Lai believes it is important to teach from the heart and with great passion as it is the best gift to the students. Award-winner Lai believes that one should teach from the heart and with great passion. 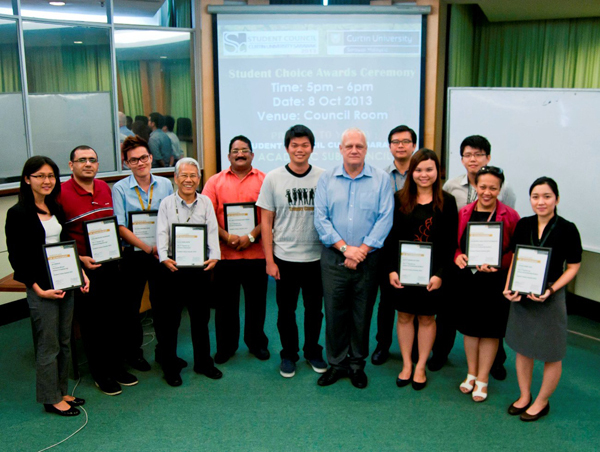 Miri – 14 October 2013 – 10 academics of Curtin University, Sarawak Malaysia (Curtin Sarawak) recently received Student Choice Awards in recognition of their teaching excellence and commitment to providing the best academic support to their students. They were from the university’s School of Engineering and Science, School of Business and School of Continuing Studies. 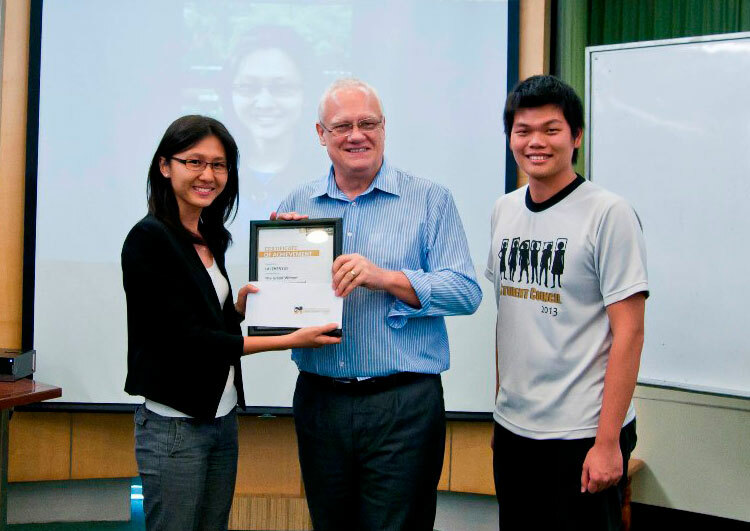 The annual awards are presented by the Curtin Sarawak Student Council and the winners are chosen by students of the university. This year, over one thousand student votes were received in a week of voting. The respective winners of the grand prize and first runner-up prize for the School of Engineering and Science were lecturers Lai Zhenyue and Foad Motabeli, both of the school’s Science and Foundation Department. Joint winners of the second runner-up prize were senior lecturer and head of the Department of Civil and Construction Engineering Dr. Tang Fu Ee and lecturer Dr. Garenth Lim King Hann of the Department of Electrical and Computer Engineering. Meanwhile, for the School of Business, associate lecturer Delon Chai Wei How of the school’s Department of Foundation Studies won the grand prize, followed by senior lecturer Dr. Abey P. Philips of the Department of Economics and Finance and lecturer Chan Kwok Mow of the Department of Accounting in second and third place. Grand prize winner for the School of Continuing Studies was associate lecturer Winnifred Winston Manggie of the Department of Language Studies and Humanities while associate lecturer Kathy Pang Kai Chin of the Department of Diploma Studies and associate lecturer Esther Liong Lalo of the Department of Language Studies and Humanities came in second and third. In his speech during the award ceremony attended by the deans and heads of department of the schools as well as Student Council members and awardees, Curtin Sarawak Pro Vice-Chancellor and Chief Executive Professor Jim Mienczakowski said that it was good for Curtin Sarawak’s students to be able to nominate and vote for academics they considered outstanding and exemplary models for their peers to follow. “Who better than our own students, who are the direct beneficiaries of their teaching and commitment to the enhancement of the learning experience, among other criteria, to judge just how effective they have been as academics,” he remarked. He went on to say that Curtin Sarawak’s academics are frequently recognised for their teaching excellence, often at international level, and they consistently keep up with the latest developments in their subject areas and integrate the newest advancements in educational technology into their classes. “This is because, at Curtin, we emphasise the need for students to remain at the very forefront of technological and educational progress. 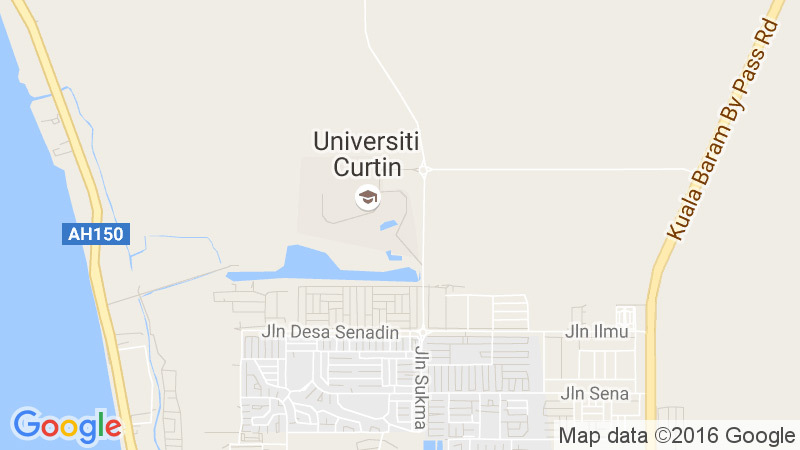 When Curtin graduates step out into the world, they are equipped with the most up-to-date information and skills relevant to their new careers,” he said. He added that the academics, who come from some 15 countries around the world and with a high number of them holding doctorates in their fields, enable Curtin Sarawak to adopt a truly global focus. Lai Zhenyue (left) receiving her award from Professor Jim Mienczakowski as Student Council President Jude Lim looks on. The winners, Professor Mienczakowski and Jude Lim in a photo call at the end of the ceremony.